Another Written Tycoon Colt comes to Dalziel Racing! 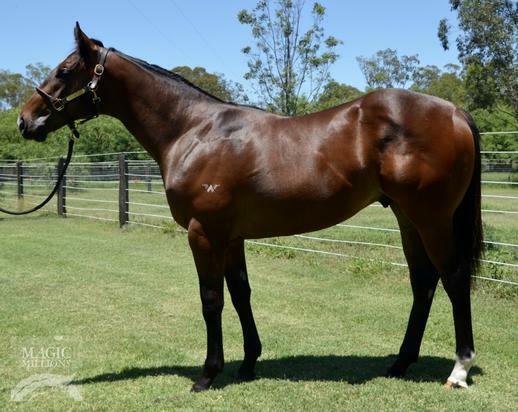 This colt is Vobis Qualified and from the first crop eligible for the new $1m Vobis Sires! He's a strong individual who is related to the 11-time Group 2 winning mare TICKLE MY. Lot 546 MM 2018 - Written Tycoon x Belong to Peri FINAL PDS from Dalziel Racing on Vimeo. WRITTEN TYCOON (AUS) (Chestnut 2002-Stud 2007). 2 wins at 2, STC Todman Slipper Trial S., Gr.2. Leading Aust. Sire of 2YOs 2015-16. Sire of 545 rnrs, 401 wnrs, 24 SW, inc. Capitalist (ATC Golden Slipper S., Gr.1), (La) Luna Rossa, Tycoon Tara, Music Magnate, Written By, Howmuchdoyouloveme, Super Cash, Winning Rupert, Rich Enuff, Booker, Written Dash, Trump, Vibrant Rouge, Hot Dipped, Grande Rosso, It is Written, Balf's Choice, Grand Tycoon, etc. Teriki (f. by Written Tycoon). 7 wins-1 at 2-to 1200m, A$122,499, to 2017-18, TRC Kevin Sharkie H., TTC Fish 'n' Chips at Seaport H., Premium Events Catering H., TRC Lark Distillery H., Devonport RC Simons Design Centre H., 2d TRC PFD Food Services Autumn H., Wolf Blass Autumn H., Hazell Brothers H., TTC Legal Solutions H., Devonport RC Simons Design Centre H., 3d TTC Magic Millions 3YO H., TRC Lady Lynette S., Raine & Horne Autumn H., TTC Cub H., TRC Lyden Builders H.
Snitz. 5 wins-1 at 2-to 1400m, A$270,925, to 2017-18, BRC Herron Todd White H., Canadian Club H., QScan Radiology Clinics H., Clarence River JC NRRA Country Championship Qualifier, 2d BRC Doomben Cup Raceday 2YO H., VCV Brisbane H., 3d BRC Makers Mark P., S George Sells Strawberries H., Kiss & Make Up Aquis Farm 2YO H.
I'LL HAVE A BIT (Smart Missile). 2 wins-1 at 2-at 1200m, A$611,435, to 2017-18, SAJC Euclase S., Gr.2, National S., Gr.3, 2d Moonee Valley Fillies Classic, Gr.2, 3d SAJC Goodwood S., Gr.1, VRC Phar Lap Club 2YO P.
Cranbrook. 3 wins to 1200m to 2017-18, TTC Mud Bar & Restaurant H., 3d TTC Cressy Cricket Club H., Dolly's Dream Foundation H.
Belong to Peri. 3 wins. See above. Gallow Gate. 8 wins from 1200m to 2100m, A$113,050, to 2017-18, TTC Brooklyn Park H., JG Pest Control 10 Years P., Dolly's Dream H., Foot and Playsted H., Relay for Life H., Electro Rewinds H., Samios H., Neil Buckby Motors H., 2d TTC Brisbane St News & Lotto H., Luxbet H., Ken Evans Memorial P., 3d TTC Carrick P.